Nice Hige Fade. Denim Jeans with Talon 42 Zipper. Orange Tap. Local Pickup OK. SIZE IS 32"W AND 29" L. THESE ARE IN VERY GOOD CONDITION MADE IN THE USA BY MAVERICKS. Great pair of jeans. Very well taken care of. ANY OCCASIONS AND ALL ORIGINAL. #2814 SOLD AS IS GOOD LUCK ! Made in USA. We do not launder or alter them in any way, the are sold in the condition that we receive them. Excellent pre-owned condition (barely worn or washed) with two dark stains on the lower front right leg that are not that noticeable because of the dark coloring and the darkness of the denim (see all pics). These jeans are dark blue sanforized 100% cotton denim, made in the USA. Large patch pockets on the front and back. The thighs are snug and the leg widens substantially below the knee. They are starched, stiff and pressed, many are dusty from years of storage, ALL should be washed before being worn. Made in the USA! Plain Pockets is a JCPenny line and whats crazy is how well these were made! Look how well they’ve held up and they are around 40 years old or more! The only issue is that there is a crease line on the pants. True vintage. Minor wear and fade. Small discoloration spot. Nice condition. Brass Talon Zipper. 36x29. They are starched and pressed, many are dusty from years of storage, ALL should be washed before being worn. They will tighten up when dried and give again after about 15 minutes of wear. This is normal and to be expected! Nice pair of distressed worn wranglers from the 60s Beautiful wear and fade to them Size tag is marked as 30 x 34 but measure to be a 29x32 Wear shown in pictures Measurements Waist laying flat 14.5 inches Inseam 32 inches Message me if you have any further questions! SIZE IS 29"W AND 32" L. WITH 10.5" WIDE BELLS THESE ARE GREAT AND VERY WEARABLE AND FOR ANY OCCASIONS AND ALL ORIGINAL. GOOD LUCK ! 84% COTTON /16% POLYESTER THIN WALE CORDUROY. REALLY GREAT CLASSIC JEANS. STAIN LOWER RIGHT LEG. SOLID JEANS. These are our standard rates. Rates will be higher for large sizes or extra heavy jeans. Cotton Denim. BELL BOTTOM. All clothing in our inventory have had a gentle wash and drip dry. BLUE JEANS. Classic Wash/Wear Navy. Blue with orange stitching. noted: one 1" spot of discoloration (above left front pocket). REALLY GREAT CLASSIC JEAN SHORTS. SOLID JEAN SHORTS. 100% COTTON LIGHT WEIGHT DENIM. These are our standard rates. Rates will be higher for large sizes or extra heavy jeans. U.S.A. CANADA OTHERS. AS IS ONLY. CHEMIN DE FER. CHEMIN DE FER STRAIGHT-LEG CUT. CREAM CORDUROY MATERIAL. 100% COTTON THIN WALE CORDUROY. <--Jean--> ERR. (26.7cm) Across Thigh. (20.3cm) Leg Opening. These are our standard rates. LEVIS 573 BIG E. TALON 42 ZIPPER. BACK POCKET RIVET'S. FRONT RISE-12 1/2. Very good pre-owned condition. Made in USA. Orange tab. Embroidered pockets. REALLY GREAT CLASSIC PANTS. NICE PANTS! DON'T LET THESE GREAT PANTS GET BY YOU! 100% POLYESTER. These are our standard rates. Rates will be higher for large sizes or extra heavy jeans. IMPORTANT . POLY/COTTON BLEND THIN WALE CORDUROY. Scroll Down For More Pictures. These are our standard rates. Rates will be higher for large sizes or extra heavy jeans. U.S.A. CANADA OTHERS. GREAT POCKETS. AS IS ONLY. REALLY GREAT CLASSIC JEANS. NICE JEANS! BLUES - DARK. These are our standard rates. Rates will be higher for large sizes or extra heavy jeans. DON'T LET THESE GREAT JEANS GET BY YOU! U.S.A. CANADA OTHERS. 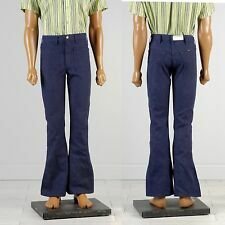 These are original Levi's orange tab bell bottoms flare jeans from the 1970's, denim has a good fade, with zip fly. Je peux combiner l'envoi si vous achetez plusieurs objets. Hauteur de la taille à l'entrejambe:30 cm. JC PENNEY'S. 75% COTTON / 25% POLYESTER THIN WALE CORDUROY. REALLY GREAT CLASSIC JEANS. NICE JEANS! DON'T LET THESE GREAT JEANS GET BY YOU! These are our standard rates. Rates will be higher for large sizes or extra heavy jeans. REALLY GREAT CLASSIC JEANS. NICE JEANS! These are our standard rates. Rates will be higher for large sizes or extra heavy jeans. DON'T LET THESE GREAT JEANS GET BY YOU! (21.6cm) Leg Opening. (29.2cm) Rise. REALLY GREAT CLASSIC JEANS. NICE JEANS! These are our standard rates. Rates will be higher for large sizes or extra heavy jeans. DON'T LET THESE GREAT JEANS GET BY YOU! U.S.A. CANADA OTHERS. HEAVY STARCH. LEE RIDERS. REALLY GREAT CLASSIC PANTS. NICE PANTS! DON'T LET THESE GREAT PANTS GET BY YOU! (21.6cm) Leg Opening. (27.9cm) Rise. These are our standard rates. Rates will be higher for large sizes or extra heavy jeans. OLD SCHOOL JEANS. NICE JEANS! BLUES - DARK. These are our standard rates. Rates will be higher for large sizes or extra heavy jeans. DON'T LET THESE GREAT JEANS GET BY YOU! U.S.A. CANADA OTHERS. OLD SCHOOL PANTS. REALLY NICE PANTS! DON'T LET THESE GREAT PANTS GET BY YOU! These are our standard rates. Rates will be higher for large sizes or extra heavy jeans. U.S.A. CANADA OTHERS. AS IS ONLY. OLD SCHOOL JEANS. LARGE STAIN RIGHT THIGH. NICE JEANS! CLASSIC, STRAIGHT LEG. These are our standard rates. Rates will be higher for large sizes or extra heavy jeans. (26.7cm) Rise. TINY SCUFF MARK LEFT THIGH. COLOR: MULTI PLAID. MADE OF: COTTON DENIM. CONDITION: NICE HAS A SMALL RED SPOT ON THE UPPER FRONT (MINOR). LENGTH: INSEAM 29. WIDTH: WAIST 29. FRONT RISE: 11. If you are very particular, then used clothing may not be for you. 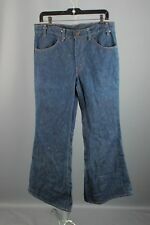 LA13414 VERY COOL VINTAGE 1970s **FLARE LEG** JEANS 33x29; IVORY! VERY TINY STAIN RIGHT THIGH. (29.2cm) Across Thigh. These are our standard rates. Rates will be higher for large sizes or extra heavy jeans. (22.9cm) Leg Opening. (29.2cm) Rise. IF THESE ARE YOUR SIZE YOU BETTER GRAB THEM NOW!